Tombs at the small Golden Mosque. bl.uk > Online Gallery Home	> Online exhibitions	> Asia, Pacific and Africa Collections	> Tombs at the small Golden Mosque. 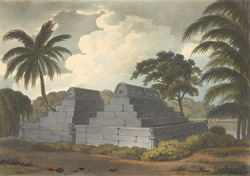 In 1787 a visitor to Gaur, Reuben Burrow, described the ruins in a journal deposited in the library of the East India Company, 'these tombs were, not long ago, in perfect order, and were held in a manner sacred, till they were torn to pieces for the sake of the stone.' This aquatint shows two Muslim tombs each comprising several black basalt carved tiers on which a cenotaph sits at the top. They were located outside the Chota Sona Masjid or Small Golden Mosque in the Rajshahi District of modern-day Bangladesh.